TCM's January star of the month is the avuncular Fred MacMurray. 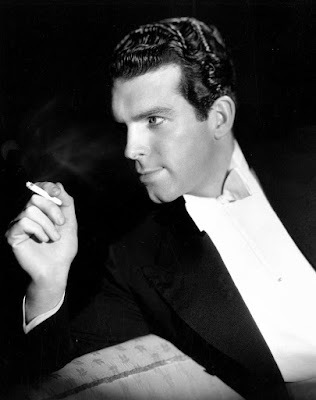 TCM is honoring Fred MacMurray with 32 movie airing each Wednesday evening in January. Here's what you need to know about one of the longest lasting actors in Hollywood. FYI: TCM sometimes changes the air times and /or movies, so you can go to www.tcm.com to check the updated schedule. Born: Aug. 30, 1908, in Kankakee, Ill.
Died: Nov. 5, 1991, in Santa Monica, Calif. MacMurray is buried in Holy Cross Cemetery in Culver City, Calif.
Brief bio: MacMurray grew up in Beaver Dam, Wis. He had a very happy childhood, learning to play the saxophone and becoming a sports star in football, basketball, and baseball. MacMurray wanted to become a musician, and he began playing the saxophone for a living, first in local big bands and then with Gus Arnheim and his Coconut Grove Orchestra. MacMurray eventually turned to acting, and he got his big break in the Broadway play, Roberta. He signed a seven-year contract with Paramount Pictures in 1934, and MacMurray's solid good looks and work ethic soon earned him a spot as a top leading man opposite stars like Katharine Hepburn, Carole Lombard, and Claudette Colbert. MacMurray began to branch out in the 1940's successfully playing a spy in Above Suspicion (1943) and a bumbling loser in the musical, Where Do We Go from Here? (1945), but his most memorable role was as scheming insurance salesman Walter Neff in the classic film noir, Double Indemnity (1944). MacMurray continued to stretch himself in the 1950's and 1960's, taking on challenging roles in The Caine Mutiny (1954) and The Apartment (1960), but he became best-known as America's father figure in a series of Disney movies and on the long-running sitcom, My Three Sons. MacMurray retired in 1978. He enjoyed spending time on his Sonoma County ranch and playing golf until he died from several lung-related illnesses in 1991. Fred MacMurray and Gloria Swanson during her 1965 guest role on My Three Sons. Fun Fact: MacMurray was one of the highest-paid actors in Hollywood, reportedly earning more than even Bob Hope and Bing Crosby. My picks are two films by writer and director Billy Wilder, a screwball comedy, and a fun family movie. Week 1. True Confession (1937) airing at 8 p.m.: MacMurray and Carole Lombard were a great screen team, and this underrated comedy is a delightful pairing of the two stars. MacMurray is a scrupulously honest attorney who is married to Lombard's compulsive liar. When Lombard is framed for murder, hilarious hi-jinks ensue powered by Lombard's bravura performance. Week 2. Double Indemnity airing at 8 p.m.: TCM is airing all four of MacMurray's films with Barbara Stanwyck on Jan. 13. If you haven't seen it, don't miss Double Indemnity, which is one of the best films noir ever made. You're in for 108 minutes of superb entertainment featuring Wilder and Raymond Chandler's sharp script, Stanwyck's devious femme fatale, and MacMurray's superb performance as a sleazy insurance agent turned murderer. Week 3. The Apartment airing at 10:15 p.m.: MacMurray gives a great performance in Wilder's corrosive satire as a amoral executive who uses his ambitious employee's (Jack Lemmon) apartment as a place for extramarital affairs. Week 4. The Absent-Minded Professor (1961) airing at 8 p.m.: MacMurray appeared in six films for Walt Disney, but this fun family comedy is one of the best. MacMurray plays a college professor who invents an anti-gravity device known as flubber. Old Hollywood video: MacMurray in a vintage Greyhound commercial. 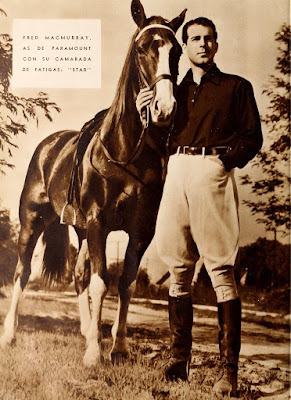 Fan Magazine Flashback: MacMurray in a 1936 issue of the Spanish language magazine Cinemundial. Courtesy of the Media History Digital Library. Old Hollywood GIF: MacMurray and Nancy Olson take an unusual tour of the Washington Monument in The Absent-Minded Professor. via Giphy. There'll be more on MacMurray on social media. Follow me on Tumblr, Google+ or Pinterest or like us on Facebook. Follow me on Twitter @oldhollywood21. I didn't realize there was a remake of The Absent-Minded Professor. I'll have to check it out.